Pennsylvania hospitals have seen soaring rates of babies born addicted to opioids over the last 15 years, a reflection of the national epidemic of pain pill and heroin abuse, according to a new state analysis. The Pennsylvania Health Care Cost Containment Council used hospital records from 2000 through 2015 to figure out how often mothers and newborns were hospitalized because of addiction issues. In 2015, 2,691 newborns were hospitalized in Pennsylvania for substance-related problems, or almost 2 percent of the 138,000 infant hospitalizations. The rate shot up by 250 percent from 2000 to 2015, when nearly 20 out of every 1,000 newborn hospital stays were because of drugs. Most often — 82 percent of the time — the babies were born addicted to the opioids their mothers took. The babies needed treatment for symptoms of withdrawal, including tremors, incessant crying, sweating, diarrhea and poor feeding. Getting a baby safely off opioids usually starts with doses of oral morphine, which then are gradually reduced. The care for all babies born with substance abuse issues added 27,835 hospital days in 2015 statewide. That cost the Medicaid program, which covers the poor, an extra $20.3 million, the analysis found. 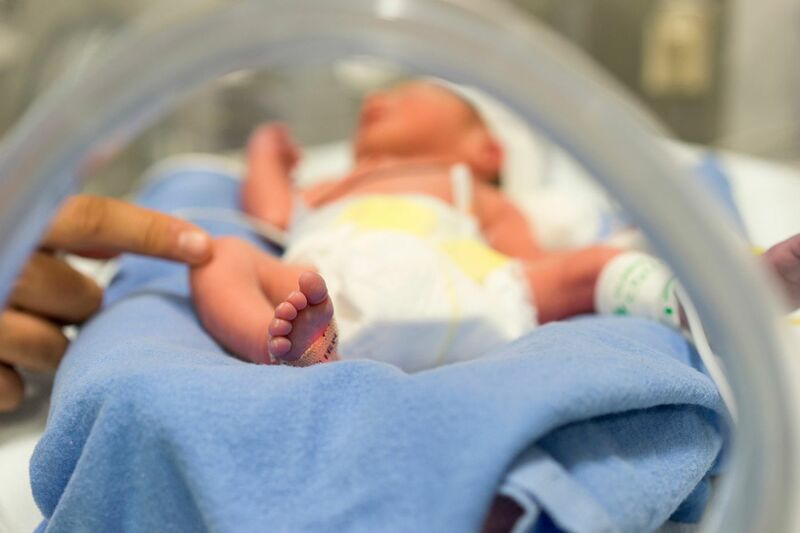 "It's hugely expensive," said Jay Greenspan, a neonatologist and chair of pediatrics at Thomas Jefferson University/Nemours, where about 100 addicted babies are delivered each year. "The average length of stay for a baby with neonatal abstinence syndrome is 30 days." At Abington Hospital-Jefferson Health, one of the largest maternity hospitals in the state, 10 percent of the 600 or so babies treated annually in the neonatal intensive care unit in recent years have suffered from opioid dependence, said Gerard M. Cleary, medical director of the NICU there. Cleary said most cases are not a surprise: The mothers are on methadone or buprenorphine, the two most common treatments for addiction to prescription pain pills or heroin. Both treatment drugs are opioids. Babies typically start experiencing withdrawal symptoms 24 to 48 hours after birth, he said, soon enough to catch even cases where the mother's substance use was unknown, he said. The greatest danger would be if withdrawal symptoms did not start until the baby was at home. Abington has recently been able to reduce the length of time required to wean the babies off morphine, he said, by increasing its emphasis on "non-pharmacologic" approaches such as bundling the babies, breast-feeding, and, when their symptoms are under control, placing baby and mother together in a private room "so they can bond" and the babies experience less stimuli. Once they are released, "the babies can do very well," Cleary said, with perhaps the most important element being support from social services. The use of crack cocaine or extreme amounts of alcohol during pregnancy, both now rare, cause much more serious and potentially permanent problems than opioid abuse, he said. The new report from the state organization, known as PHC4, also examined the toll on the mothers of the babies: Of 4,615 maternal hospital stays related to substance abuse, 52 percent involved pain pills or heroin, or both. In 2015, about 17 out of every 1,000 maternal hospitalizations involved opioids, up 510 percent from 2000. Although maternal stays involving alcohol and cocaine decreased somewhat over the period, the rate of stays for all substance-related problems increased by 119 percent. The analysis also found trends that experts have lamented for years: the opioid epidemic is a suburban and rural crisis, as well as an urban one. 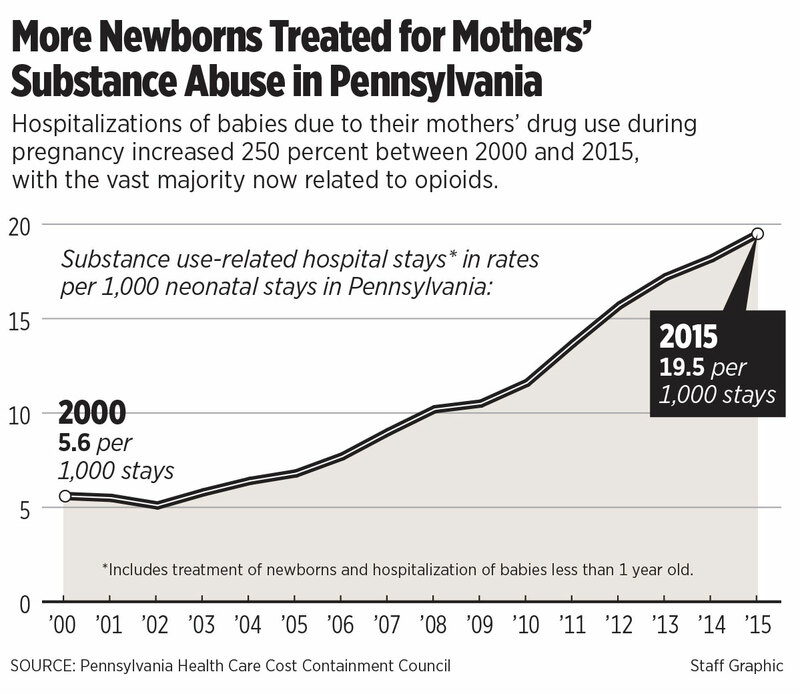 In Cambria County, which includes Johnstown, for example, 66 out of every 1,000 maternal hospital stays involved drug abuse, while the rate in neighboring Clearfield County was 77 per 1,000 stays. "If you talk to state legislators, they will tell you this is a huge problem in Western Pennsylvania," said Joe Martin, the cost containment council's executive director. "It's no longer the stereotypical inner city problem."